Improvements to ranking for local search results. [launch codename Ã¢â?¬Å?VeniceÃ¢â?¬Â] This improvement improves the triggering of Local Universal results by relying more on the ranking of our main search results as a signal. Improved local results. We launched a new system to find results from a userÃ¢â?¬â?¢s city more reliably. Now weÃ¢â?¬â?¢re better able to detect when both queries and documents are local to the user. 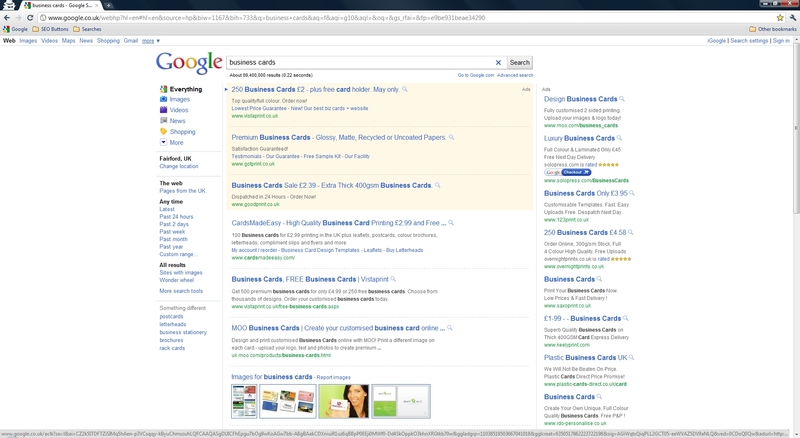 I am seeing some pretty big changes in the Google.co.uk results from this update. It seems generic queries which are deemed to have local relevance (or intent) have more local results integrated from the main algorithmic results. Notice how the top 5 organic results are the same. But after that Repair Care’s ‘Camberley’ page now ranks, Yell.com and thedomesticrepair.co.uk are now on the 1st page as well. 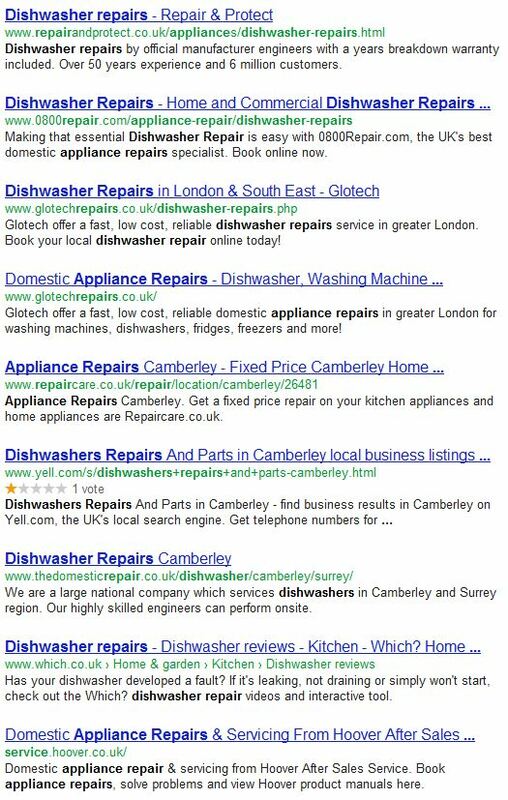 If you run a search for ‘dishwasher repairs camberley’, you’ll notice the top 2 results (other than those already in the top 10 for the search before the update) are Yell.com and thedomesticrepair.co.uk. So it seems these are now integrated into the SERPs. This is just one example, I found the same across a variety of search queries we monitor for clients who provide services where location can be relevant. If you search for ‘car insurance’, there has been zero impact. Google have our location wrong. I am based in Henley-on-Thames, Camberley is a fair distance away and irrelevant. The map listings (which I removed from the screenshot above) are actually showing results for ‘Reading’. Now this is a far more relevant result. So why are the two systems using different location detection? Odd. You can’t seem to turn this location personalisation off with ease (you can manually change your location though!). This could have a big impact on ranking reports. 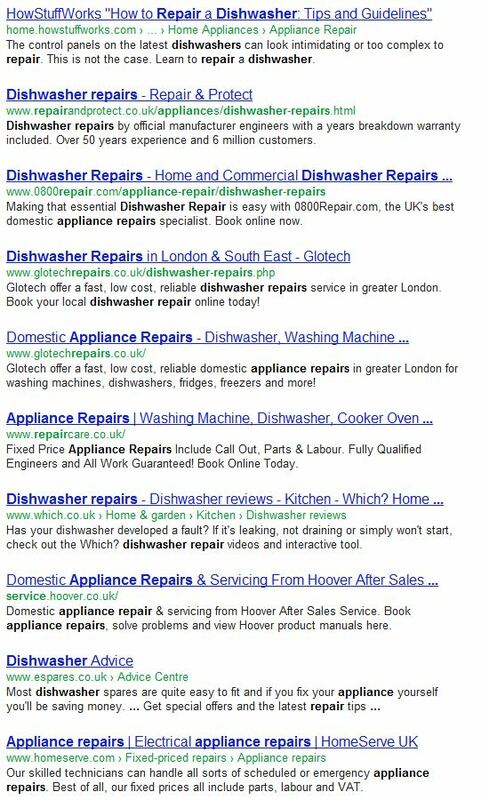 The only way we have found, is via the following search query – https://www.google.com/search?pws=0&gl=UK&q=dishwasher%20repairs. If you run the same on Google.co.uk (ie, change it from .com to .co.uk), Google will detect your location again..! Are you noticing any changes from this update? Although the basic layout is similar, the new design has a lot more space between each result, which will (in my opinion at least) mean an increased CTR on the very top positions. You can see a full size screenshoot here. I personally think this makes the organic results look pretty cluttered and I found them harder to read. I spotted a test last month where Google were adding spaces between keywords in Adwords display urls and today I have just noticed a new test, but this time for the organic results. I am not sure if this is entirely new (certainly not something I can remember seeing before), but Google seem to be testing capitalising the keyword in the display URL that matches the search query. 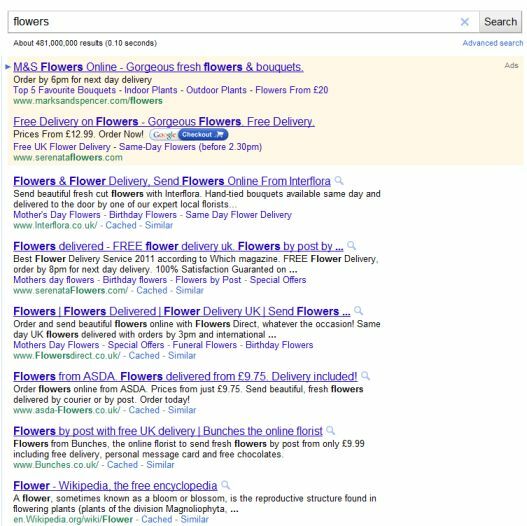 I captured a screenshot of a query for ‘flowers’ here in Google.co.uk. Notice how the words ‘Flower’ and ‘Flowers’ are capitalised in display URLs. Like serenataFlowers.com, Flowersdirect.co.uk, asda-Flowers.co.uk etc. Almost immediately after I ran this query, Google stopped the test and I couldn’t replicate. Notice the spaces in the display urls where the keyphrases within the search query are matched against the keywords within the domain in the display url. So ‘superbreak.com’ becomes ‘super break.com’ with a space. In my opinion this looks odd and is more confusing at a glance. This is obviously something Google are testing and alongside their recent background colour change to yellow, we have no doubt it’s with a view to increasing CTR. Adwords Ads Background Back To Yellow? I first noticed this about a week ago while running some queries in the US and the tests still don’t seem to be completely widespread just yet. 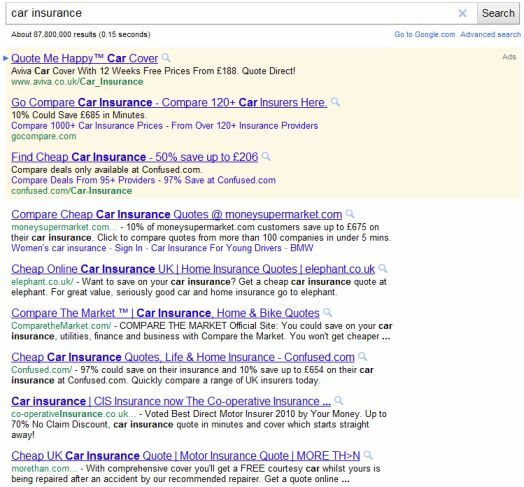 We first saw a yellow ad background colour in 2007 (before turning to a pink PPC background in May 2010), although it’s difficult to tell whether this is the same yellow Google is trialing again now. The yellow now in these tests looks a little paler. We know Google tests different background colours from time to time to test click through rates (CTR) of ads with a view to increasing them. Many have argued in the past the colour change is to attract more attention to the top PPC ad spots and hence a higher CTR. However, is the real reason behind the continued use of very pale colours actually having the opposite impact blurring the line between organic and paid results which is utlimately leading to higher CTR? You would have to say so. Update – We checked the new Adwords background colour and it’s coming out as (#FFF8E7) known as ‘cosmic latte’. Wikipedia says this is the same colour as ‘all light in the universe added up‘ and describes it as a slightly beigeish white. So….. beigeish white, very close to the organic white. :-) Although we tested the old yellow background and it does seem to be the same colour. As you might have noticed, I haven’t blogged here since August. Well, that was for a very good reason. This year I founded a new search marketing agency called Screaming Frog and have been working on a new onsite SEO tool, which has prompted this post. It has been a little while in development, but I am pleased to announce our first SEO tool for release, the Screaming Frog SEO Spider. I am a big fan of the Xenu Link Sleuth tool for finding broken links, redirects and other site issues, but wanted to build a site spider with more emphasis on SEO. I also wanted something that was usable for all SEOs that you can point and click at anytime and didn’t have to log into an interface. The ability to export everything to Excel was a must as I often like to map out SEO recommendations in this format. The Screaming Frog SEO Spider is Java based program which spiders websites links, images, CSS, script and apps. It also fetches key onsite page elements for SEO, presents them in tabs by type and allows you to filter for common SEO issues, or slice and dice the data how you see fit by exporting and importing into Excel. You can view, analyse and filter the information as it’s gathered and updated continuously in the programs user interface. The Screaming Frog SEO Spider allows you to quickly analyse or review a site from an onsite SEO perspective. It’s particulary good for analysing large sites where manually checking every page would be extremely labour intensive (or impossible!) and where you can easily miss a redirect, meta refresh or duplicate page issue. What Information Does The Screaming Frog SEO Spider Report? The lite version of the tool is completely free and allows you to crawl up to 500 URIs. The configuration options for crawling and excluding of file paths are not included. A license for Â£99 per annum will remove the 500 URI crawl limit and allow access to the spider options menu. What Is Next For The Screaming Frog SEO Tool? The tool is a very early version and we have some big plans over the coming months with many new features in the pipeline. If there is anything specific you think we should add, please do leave the feedback below, send an e-mail or tweet it to me @screamingfrog. Although, looking at the list of features to add, it might well already be on there! Keep updated with future release of the tool by checking for updates in the interface, subscribing to the PPC Blog RSS, signing up to our e-mail above or following me on Twitter @screamingfrog. Google Search Query Reports: Beware Other Unique Queries! Ever since Google launched the Search Query Report in AdWords, advertisers have been using the data to refine and evaluate their current keyword lists, identifying any potential new keywords that they could add into their accounts. Now I know that there have been countless occasions when people have found examples of advertisers simply copying the data out of the reports and into their live campaigns without looking at what they are adding & I even used it as an example of not what to do when I was training a new employee about how to use the reports. As I was running a SQR this morning I wondered if people had actually taken on board all the talk and mickey taking that had gone on before about simply taking the data without looking at it first. You can see from the screenshot below that the answer is obviously NO. Now the fact that advertiser number 2 is using Unicode symbols in their Sitelink ad extensions makes me believe that they are not new to the industry and that they do read all the various PPC blogs out there as this is something that has been discussed at great length recently but this then begs the question- did they ignore all the previous stuff about taking all the data from their Search Query Reports? The Google Search Query Performance report is a great tool to use when looking at what your keywords are doing and what they are matching against but unless you use it properly you can end up looking very silly and being laughed at by the rest of us… You have been warned! 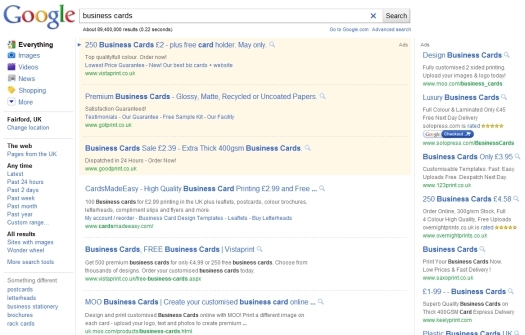 Google started testing Adwords comparison ads last year and subsequently rolled out credit card comparison adverts in the UK during February this year. Typically the adverts have been within the usual top sponsored ad positions in the usual Adwords format at the expense of an advertiser. You can see a much bigger screenshot here. 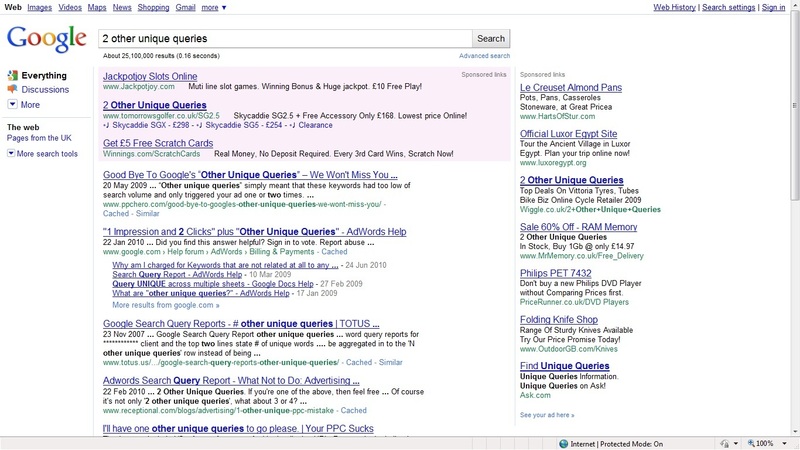 Over the past couple of weeks Google have been testing new background colours for their Adwords ads again. 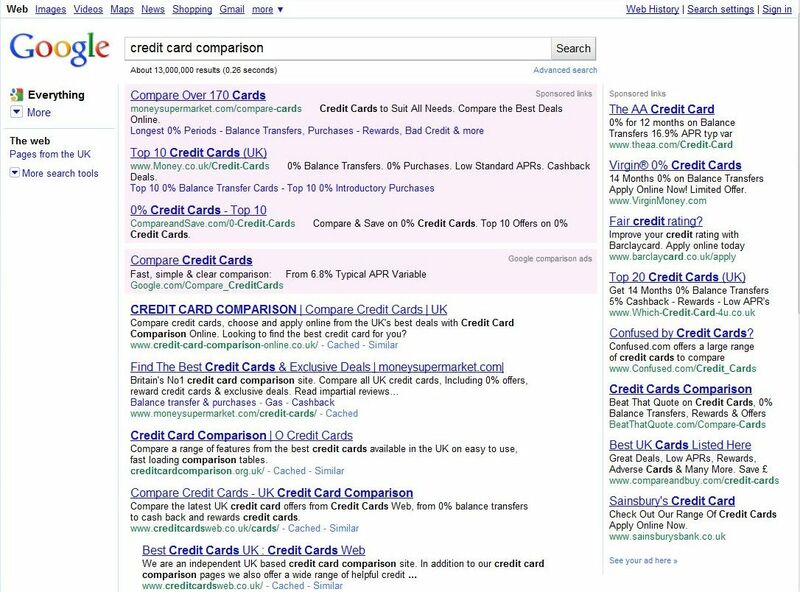 Google changed from their usual blue background to a yellow back in 2007 which is what we see predominantly today in the SERPs. Are you seeing any other colours?